Small business owner: "What's with these funny new barcodes?" - Rescue Marketing, Inc.
You may have seen those odd-looking square barcodes in newspapers and magazines, on product boxes, etc. You might even have noticed them in the middle of the star-shaped signage in some Macy’s television commercials. Why should business owners should care about them? A smartphone can scan/read a QR code, which will take it to a specific web site address (URL). Why use them at all? Who really cares about yet another barcode? Your prospects and customers do. Some of your websites make it really hard to buy. For prospects and customers using smartphones, it can be particularly annoying. But your customers don’t use smartphones, right? Let’s talk about that. Currently, Nielsen (yes, those TV ratings people count other things too) says 40% of U.S. cell phone users use a smartphone. A web search will tell you that there are 327 million active mobile subscriptions in the U.S. Yes, that’s more mobile subscriptions than there are adults, per the 2010 census. The numbers get a little whacked partly because of the number of people with a personal account/cellphone and a business one (provided to them or otherwise). 327 million is a fairly big number. Too big, maybe. To get a better handle on the numbers, a glance at a 2009 CTIA (wireless telecom industry group) survey of their members report indicated that 257 million Americans have data-capable devices and about half of those are phones. The rest are laptops and tablets. So we’ve reduced the number to roughly half the population, which is close to the Nielsen number. Again, that’s a end-of-2009 number….BEFORE the availability of iPhone4 (and 4S), iPad and other modern-ish tablets. Seems to me a number that’s even 10 million smartphones too big would be enough to provoke interest in the experience mobile/smartphone website users have at your site. So now that you have big scary (or exciting) numbers to think about – particularly if your business deals in retail, tourism and other core business-to-consumer fields – get back to solving “we make it hard to buy” problem. Never (yes, never) use your home page URL as the destination. Reason #1 – QR code users are, by definition, mobile users. Presumably you have a URL that is designed to be used by mobile browser users so they don’t spend all of their time squinting, pinching and spreading (or pressing zoom buttons) to read about your cool new product. If your site automatically senses mobile browsers and changes behavior or reroutes them to pages designed for mobile users, all the better. Reason #2 – Sending them directly to your home page can make it far more difficult to measure inbound visitor numbers. Why is that important? Because you want to know how your QR code links are performing by media/by ad/by publication etc. If you have them going to different URLs (web site addresses) such as MyReallyCoolsite.com/QR1 and MyReallycoolsite.com/QR2, then you can figure out their individual performance. Reason #3 – Why did they scan (and hopefully share) that QR code/URL? Because they wanted something specific that they were looking at RIGHT THEN. If I’m looking at a Corvette ad in an in-flight magazine, do I want to go to Chevy.com or do I want to go to the page that describes the smokin’ Vette I’m looking at? Consider how annoying it is to navigate not-so-mobile friendly sites on a smartphone. Make yours the friendly, easy site for mobile users. Make your customers’ life easier. Make it easier for them to visit your site, visit the right page and share something about your business that they want to share. Ask anyone in the publishing business about pass-along numbers. They’re important to readership, so much so that they claim pass-along readership as an asset to advertisers. Transfer that thought to your website, catalog, ads, trade show materials, demo products and other materials. 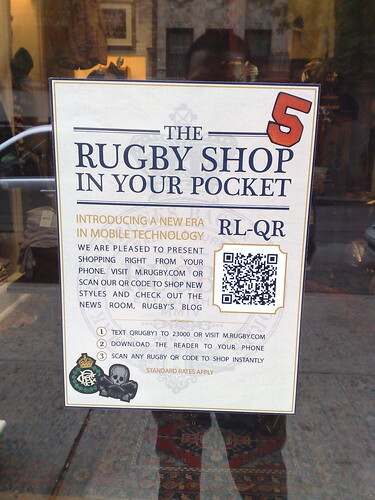 Do they need a QR code so that people can view/share them easily? In many cases, I think so. You are right that it is a nice quick way to pop up some additional info. They are kindof silly how huge they are often though (in my opinion). Thats great news, John. Others Ive talked to are seeing the same sort of changes as well.